I was only a ‘hop skip and a jump’ from Chillingham Road and I enjoyed shopping there with my mam or ‘going for messages’ for her. In those days ‘Chilly Road’ looked rather different – there were no trees, handy seats, estate agents, charity shops or supermarkets and a takeaway to us was fish and chips (taking newspaper for outer wrapping). There weren’t many cars but there were trams (later replaced by buses). There was however a wide variety of shops. Some that come to mind are – Burrel’s butchers where we bought such things as black pudding and ‘scrag end’… Pinder’s greengrocers for ‘half a stone of potatoes’… Nesbit’s bakers for an ‘Edinburgh brown’ loaf… Sayer’s greengrocers where Mam first bought frozen food – a carton of bilberries. She’d have used them fairly quickly as we never had a fridge! There was Law’s stores for groceries, Little’s Dairy, which sold wonderful ice-cream and Donkin’s toyshop which also had a lending library. Nearby was a drapers. Then there were several Co-op shops, Fong Wah’s laundry, a radio shop, Manners pork shop, two drycleaners, an off-licence, chemists, a wallpaper shop, fresh fish shop and many others. At the post office I bought sheets of colourful pictures called ‘scraps’ to stick into my scrapbook. Next to the pillar box outside was a useful stamp machine. There was a newsagent who would deliver my ‘Beano’ and ‘Dandy‘ comics and later ‘School Friend’. At the tiny branch of Clough’s we used to buy our sweets, like my favourite sherbet lollies, on the way to enjoy ‘the pictures’ along the road at the Scala. Thank you, Mrs. Fletcher, for taking the time to write and share your memories and also to Hilary Bray (nee Bates) who gave us permission to digitise and use photographs of Heaton from her collection. This entry was posted in Group Activites and tagged butcher, Chillingham Road, Clough's, Co-op, Fong Wah, laundry, Manners, post office, Scala Cinema, shops, Tru-time Watch Company, Warton Terrace on October 12, 2016 by oldheaton. Little did we think, when we published ‘Dead Man’s Handle’, the story of a railway accident that took place almost ninety years ago, that we’d be put in touch with someone who clearly remembered that night – and so much more besides. Olive Renwick was born in September 1916, so she is now approaching her 99th birthday – and she has lived in Heaton all her life. 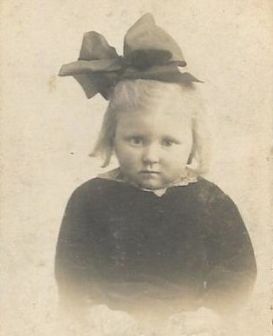 Olive is the daughter of Isabella and Francis Walter (Frank) Topping. Frank was the signalman who, on 8 August 1926, saw a passenger train coming towards his box at full speed seconds before it crashed into a goods train near Manors Station. Olive was nine years old at the time and reminded us that nobody had phones back then and so when her father didn’t return from work, the family could only sit and wait. 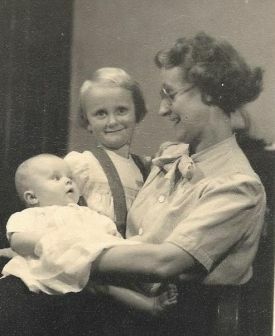 ‘My mother didn’t send my sister and me to bed’ she remembered ‘I think she was worried and wanted company’. Olive told us more about her father: he was Heaton born and bred, growing up on Simonside Terrace. But he didn’t remain a signalman. Frank became branch secretary of Newcastle Number 2 NUR branch, senior trustee for the Passenger Signalmen’s Provident Society and was, for almost 20 years from 1931, Secretary of the NER Cottage Homes and Benefit Fund. Locally, in 1911 he was ordained an Elder of Heaton Presbyterian Church, then a session clerk from 1946 until shortly before he died. 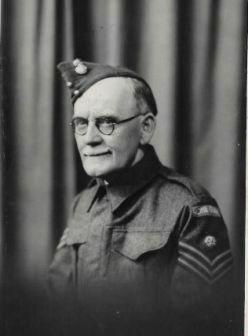 In WW2, he served in the Home Guard. 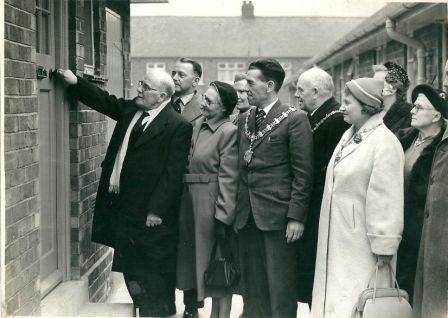 Olive showed us photographs and newspaper cuttings relating to her father including an account, with photographs, of him opening railway cottages in Hartlepool on a street named after him. Francis Topping died in 1957. It was fantastic to find out more about Frank Topping and to hear Olive’s memories of her father but we couldn’t pass up on the opportunity to hear more from someone who has lived in Heaton for almost a century. Imagine the changes she has seen. 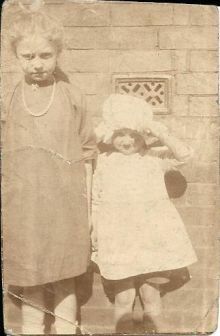 Olive was born on Warton Terrace but spent most of her childhood on Ebor Street and then Spencer Street, ‘The railway terraces. In those days, you had to be on the railways to live there’. 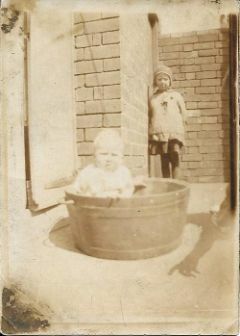 Olive with her brother, Rob, outside their house in Ebor Street. As a child, Olive was allergic to cow’s milk. She remembers that her mother walked to Meldon Terrace everyday with a jug to collect milk from a woman who kept a goat in her back yard. 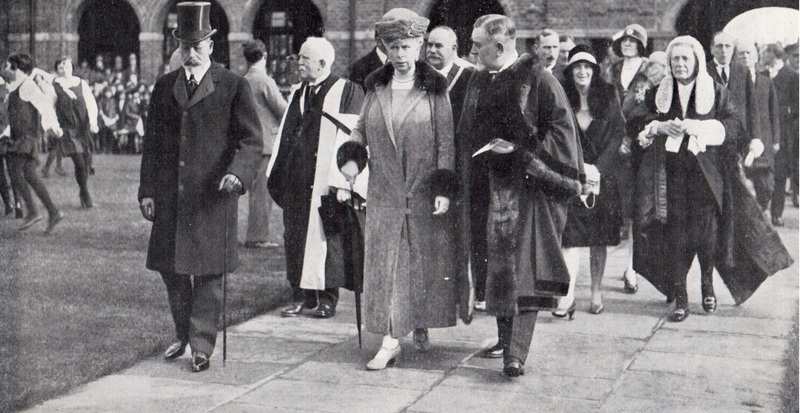 ‘I was in my first year when the King and Queen came to officially open the school. 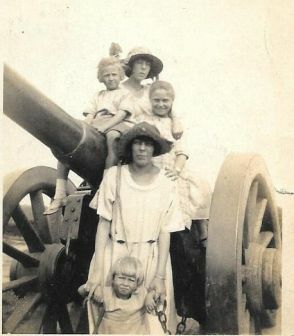 It was as we were leaving that Olive mentioned, in passing, her maternal grandparents: that they were called Wood, came originally from Ayton in Berwickshire, lived in Seventh Avenue and that her mother’s uncle Bob (Walker) grew potatoes on a field near Red Hall Drive. Could they be the same Woods that we’d researched and written about as part of our ‘Heaton Avenues in Wartime’ project. Surely they must? And indeed they were. On a return visit, Olive told us more about her grandparents, David and Isabella Wood. She confirmed that they had an allotment on railway land. She told us about visits to her great aunts in Ayton and she recounted family stories about a visit to her Uncle Robert in hospital, where he was to die from wounds received on the battlefield. 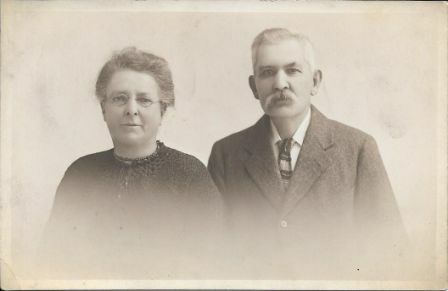 Best of all, she was able to show us photographs of both grandparents, more of which we will add to the article ‘The Woods of Seventh Avenue’. 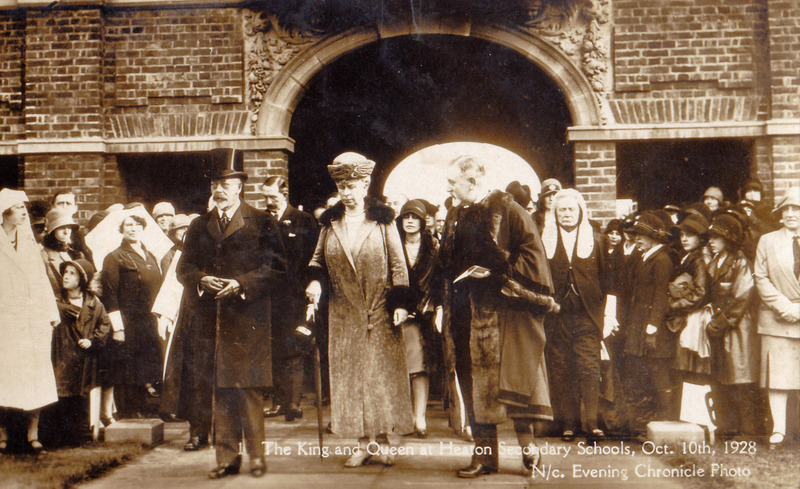 We hope that we’ll meet again soon and that she’ll be able to add even more to our knowledge of Heaton’s history. 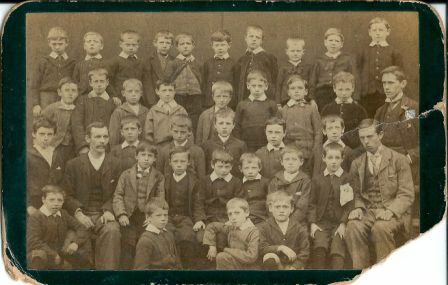 This entry was posted in Research and tagged Avenues, Chillingham Road School, cinema, Ebor Street, Francis Topping, Heaton High School, Heaton Park, Heaton Presbyterian Church, Isabella Wood, Jack Common, Meldon Terrace, musician, North View, North View School, Olive Renwick, Railway Terraces, railways, Robert Thomas Wood, royal visit, Scala Cinema, Seventh Avenue, Simonside Terrace, Spencer Street, Warton Terrace, WW1, WW2 on September 2, 2015 by oldheaton. Heaton History Group has been interviewing older Heatonians so that we can capture memories and personal photographs to complement more easily accessed published and archived material. 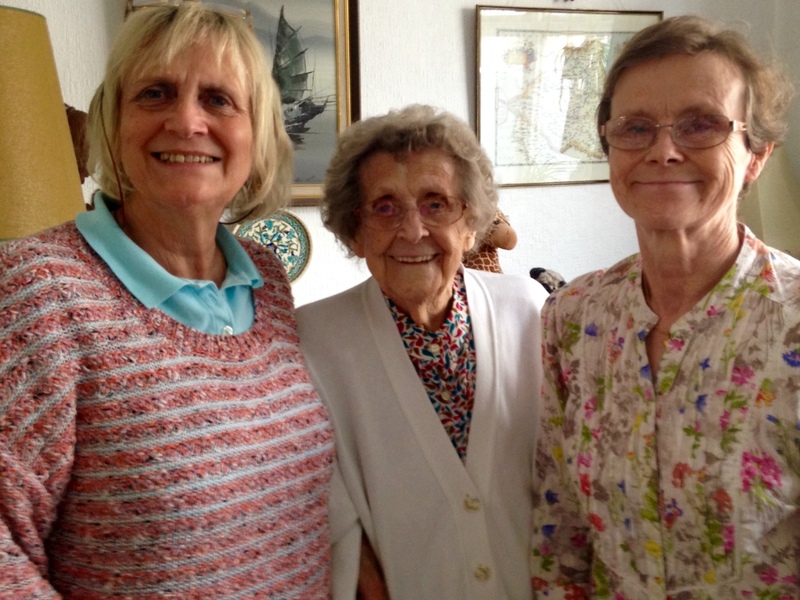 Jeanie Molyneux recently met Joan Sweeney nee Potter, who was born in 1922, lived at 23 Sackville Road until 1951 and then in Rothbury Terrace for a further 8 years. 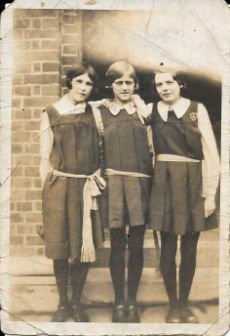 We are hoping that Mrs Sweeney’s recollections will interest other longstanding or former residents. Please add your memories to our collection either by leaving a comment on this website (by clicking on the link immediately below the article title) or by emailing chris.jackson@heatonhistorygroup.org . 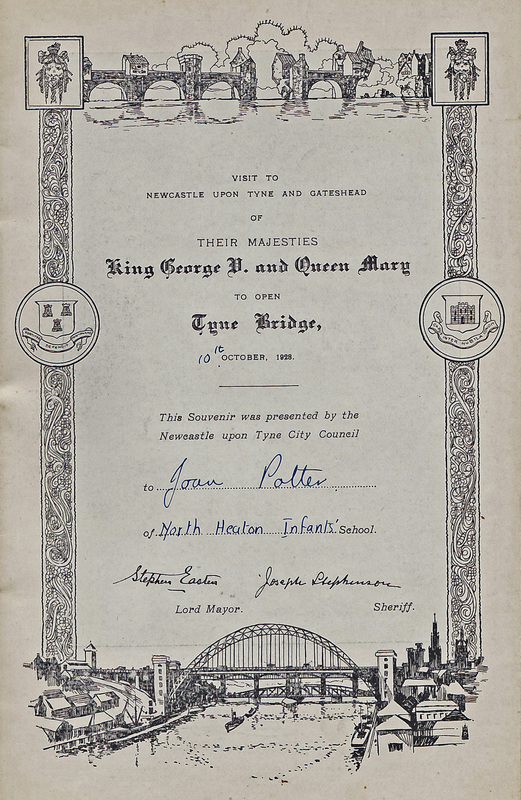 – the visit of King George V and Queen Mary to Tyneside for the opening of the Tyne Bridge on 10 October 1928. She recalls being taken to the approach Road at Armstrong Bridge by Jesmond Dene and being given a flag to wave and, later, a certificate. 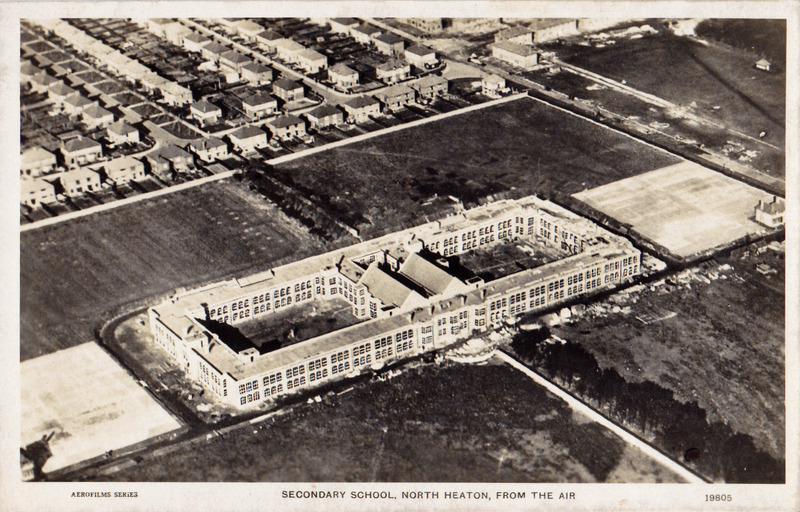 Where you there or perhaps at one of the Heaton Secondary Schools which they officially opened the same day? – playing bat and ball against the wall of the house on the corner of Stanmore Road and Ravenswood Road. She also remembers that in the backyard of her home there was a container for ashes attached to the back wall with an aperture so that the ashes could be tipped into the bath which was brought around the back streets. What did you play in the back lanes? Do you remember ashes being collected? – the blacksmith’s shop and Clarendon garage at the top of Chillingham Road (opposite Norwood Avenue). 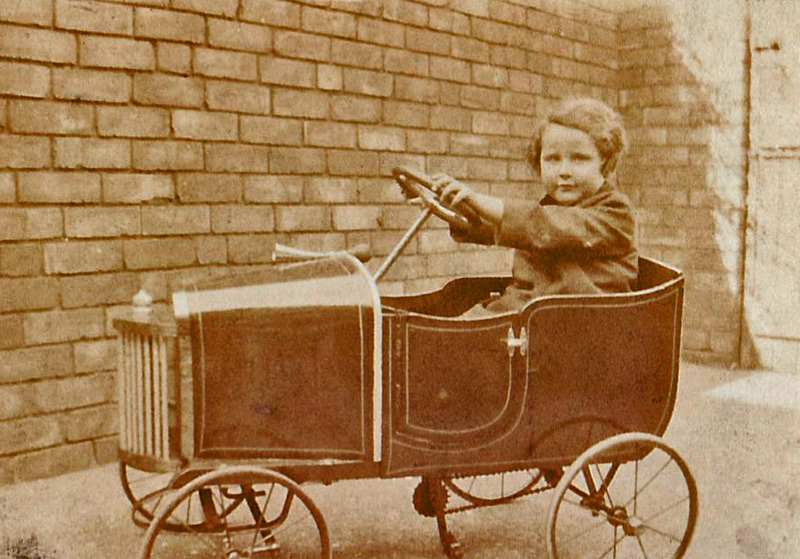 As a child, Mrs Sweeney was sent to the garage to collect batteries for the cat’s whisker (wireless / old radio). Were you sent on errands to local shops? 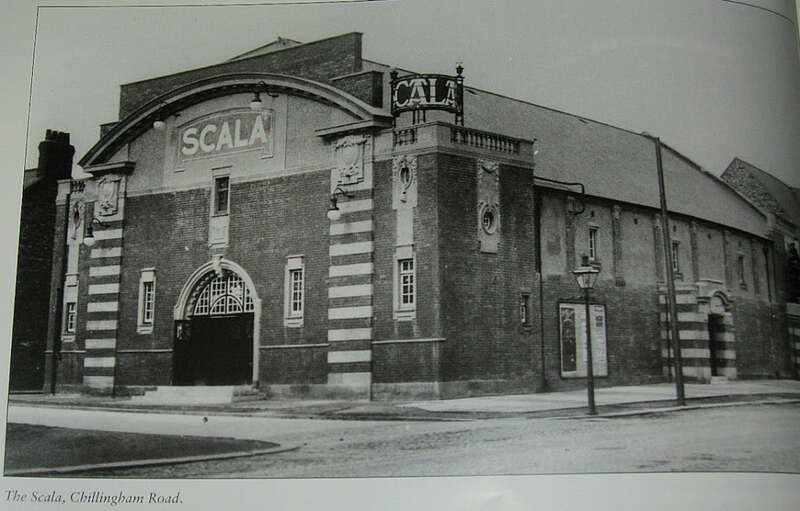 – the Scala on the corner of Chillingham Road and Tosson Terrace. The First Vets practice premises was Riddells, a photographers. Baobab Bakery was also a bakery in earlier years – the Tynedale Bakery. This photo of the bakery was taken by High Heaton photographer, Laszlo Torday. Thank you to Newcastle City Library for permission to use it. Next door was the Teesdale Dairy. They also operated a horse and cart which would travel around the area selling milk, pouring the milk from a white container directly into a jug at local residents’ homes. Do Mrs Sweeney’s memories jog yours? 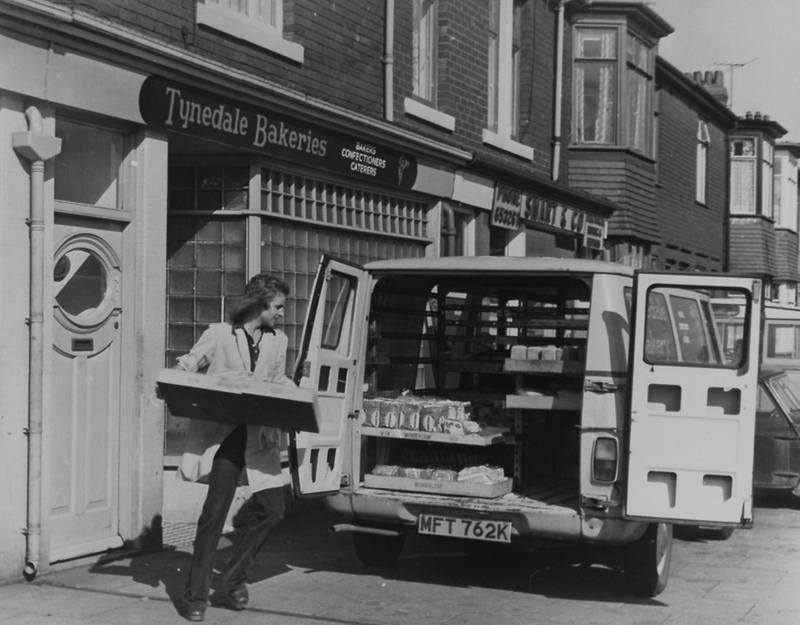 – other local shops, for example, on Rothbury Terrace from the corner of Spencer Street to Chillingham Road included Topliffe hardware store and Tulip’s chemists. She remembers a small general store on the corner of Sackville Road and Stanmore Road which sold food and she recalls helping to serve there on one occasion. Mrs Sweeney also remembers Ochletree’s, a newsagent on Addycombe Terrace on the corner of Tosson Terrace or Trewhitt Road – she is a little uncertain which. Can you help? 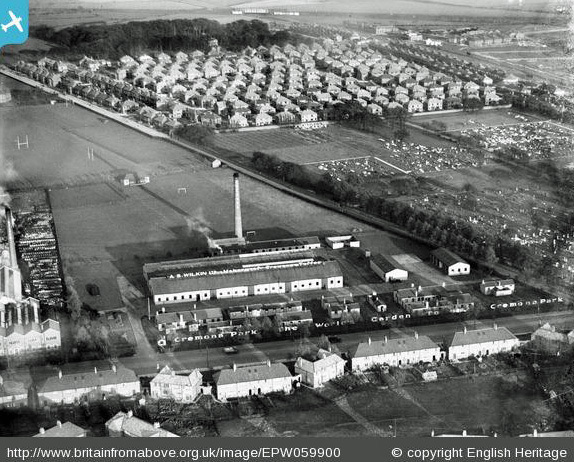 – Sainsbury’s on Benton Road was a sweet / toffee factory. Thank you to English Heritage for permission to reproduce the aerial photo below from its Britain from Above website. Also in that area was the Sylvan Jam factory, with a big chimney with the name Sylvan on the side. Mrs Sweeney remembers being able to smell strawberries when jam was being made. What smells do you remember from your Heaton childhood? – In the years before World War 2, the last tram along Heaton Road (about 11.00 pm) also had a post box on board. 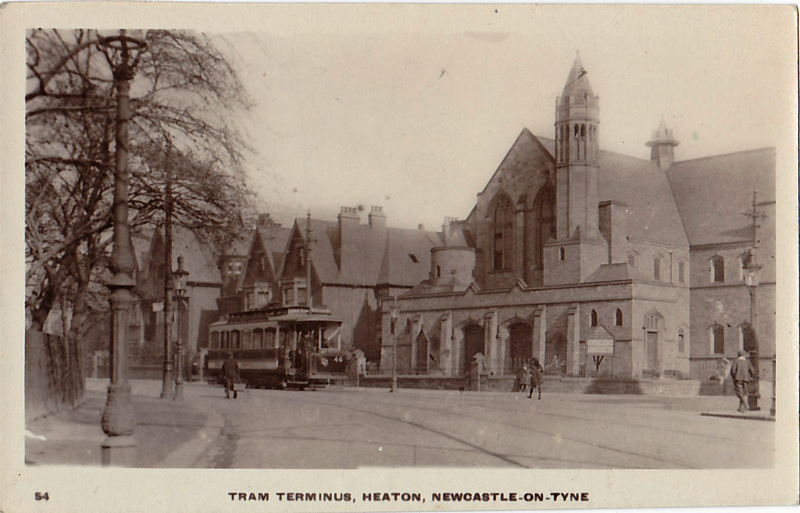 The last tram would drop the box off at the Post Office at the top of Heaton Road. She remembers occasions when she would see her father running up the road with a letter in order to catch the final tram. She also remembers that a tram (open upstairs) travelled up to Gosforth Park (she thinks possibly only at weekends). She recalls travelling on the tram to Lamb’s Tea Gardens, next to the garden centre. Do you remember taking a trip to Lambs’ or taking a tram in Heaton? This entry was posted in Group Activites, Research and tagged Addycombe Terrace, Armstrong Bridge, blacksmith, Chillingham Road, Clarendon garage, Cremona Park, Dainty Dinah, Heaton Grammar, Heaton High School, Jesmond Dene, Norwood Avenue, post office, Ravenswood Road, Rothbury Terrace, royal visit, Sackville Road, Scala Cinema, Spencer Street, St Gabriel's, Stanmore Road, Sylvan jam, Teesdale Dairy, Tosson Terrace, trams, Tynedale Bakery on November 6, 2014 by oldheaton. Being only six when The Scala closed, I would have been too young to have been allowed to go there on my own, but there is a vague memory of having visited there once, with a friend and his older sister. Certainly however, even at that young age, I was entrusted to make my own way to and from Ravenswood Primary School, and the most direct route by which to do so would have taken me past The Scala twice a day. To sum up: I may have visited it once, and must have seen it on many occasions, yet my memories of the building are faint. However, he has much clearer memories of what came next. 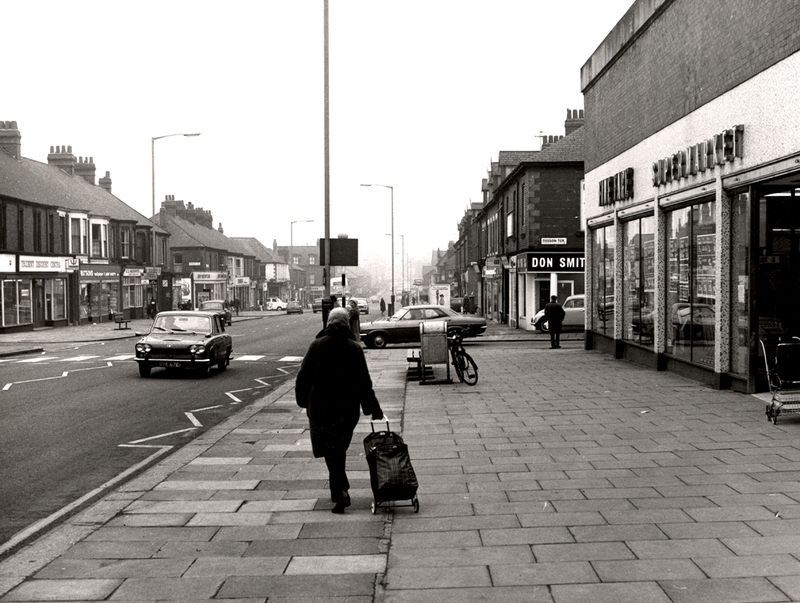 The world of retailing was changing and the old Scala was eventually demolished to make way for what RS believes to have been Chillingham Road’s – and, possibly, Heaton’s – first supermarket, a ‘Fine Fare’. The writer was there, standing on the pavement with many others – trust me, it was a big deal at the time, and there was quite a crowd – at its grand opening. I recall a bright but chilly Saturday morning and, if so, a best guess would be for sometime in the spring of 1965, when I would have been nine or ten. Predictably enough, there was a ribbon to be cut, and men in suits officiating, likely to have been a director of Fine Fare and a perhaps a local councillor. And there was a show business presence as well. On that Chillingham Road pavement, outside the Fine Fare, was a female celebrity, who I believe may have been a pop singer of the time. Now we’re not talking someone with the profile of Cilla, Dusty or Lulu here, but there was definitely someone from showbiz. I recall her having dark hair, and am tempted to have a guess at her identity … but no, that’s all it would be – a guess. But there’s more – the main attraction, in fact. On that pavement, right in front of the shop entrance, there was placed at least one trestle table – maybe more – where the star guests performed their familiar routine, well known to ITV viewers since 1956. Yes, two or three of the Brooke Bond PG Tips chimpanzees had been brought along and – suitably and safely harnessed – were put through a traditional ‘chimps’ tea party’ act, for the benefit and amusement of the assembled crowd. At least we were all led to believe they were the genuine Brooke Bond TV chimps, hitherto only ever seen in black and white: it didn’t seem to be in the spirit of the occasion to ask for proof of their identities, and they may have been random, Geordie-based chimps for all anyone could tell. But on reflection – probably not. The demanding of autographs was also judged to be an unrealistic option. And then it was all over – no doubt much to the chagrin of the various grocers, butchers, bakers etc. of that stretch of Chillingham Road, now faced with the arrival of a new form of retailing which would do their own businesses no favours at all. I shopped at the Fine Fare from time to time myself, and actually ended up working there, after school on two evenings a week and on Saturdays, in the early ’70s, when in my mid-teens, tasked with filling the freezer cabinets, but unfortunately without the benefit of an incipient frostbite allowance. No longer resident in Heaton, I still occasionally drive past the premises noting occasional changes in ownership and name. And, after a gap of probably over four decades, one afternoon in the summer of 2013, I finally ventured back inside. On leaving the old, former Fine Fare, I lingered on the pavement outside for a few seconds, and those memories of nearly half a century ago returned – the memories which you have just read. Just a Tesco Express. Who would give it a second glance or thought today? But once it mattered. Maybe only for that single Saturday morning, so long ago. But, in the history of Heaton, once it mattered. The photograph below was taken outside Fine Fare in 1974, on what appears, at first sight, to have been a somewhat less memorable moment in the history of Heaton. We have Hungarian Laszlo Torday to thank for capturing just an ordinary moment some 40 years ago. 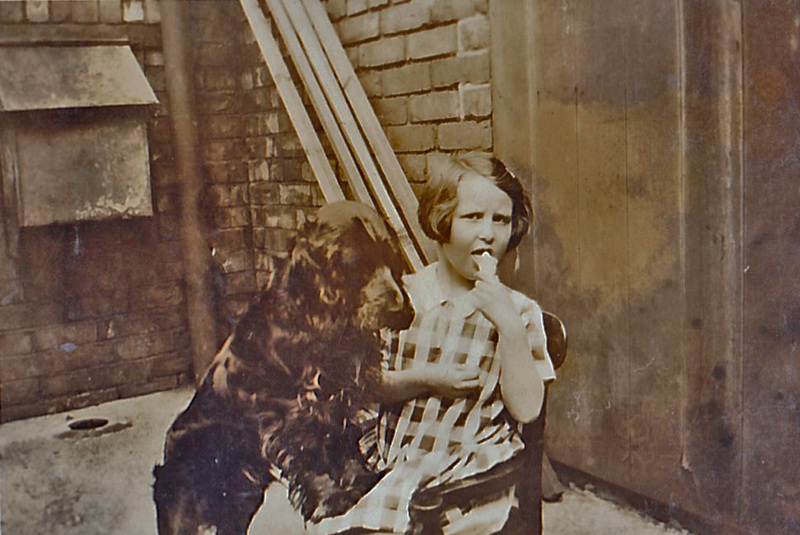 Torday was a chemical engineer and amateur photographer who took hundreds of similar everyday scenes around Newcastle – and especially around Heaton because he lived on Jesmond Park West. The writer, Paul Torday, best known for his novel, ‘Salmon Fishing in the Yemen’ was Laszlo’s son. Newcastle City Library bought Torday’s photograph albums when they came up at auction some years ago and has given us permission to reproduce this one here. See more Torday photographs here. Thank you to ‘RS’ from whose longer essay, these memories have been taken. This entry was posted in Research and tagged Chillingham Road, Fine Fare, Ravenswood Primary School, Scala Cinema, shops, supermarket, Tesco, Torday, Tosson Terrace on July 30, 2014 by oldheaton. Heaton’s first cinema, the Electric Palace, opened on the corner of North View and Heaton Road on 21 November 1910 in what a local newspaper of the time referred to as ‘a large House near to Heaton Station, and known locally as Temple’s Folly’. The building also housed assembly rooms, a billiard hall and a ballroom, which became a roller-skating rink just a couple of years later. It was said to have cost an eye-watering £30,000 to build. At the beginning, variety shows and wrestling were also a feature of its programming. The cinema also had an unusually large orchestra of 8 players. A cafe had been added by 1921. Prices were considered high though, from 4d to 1s 3d, but there was clearly a market for the programme of comedies and serials in the relatively prosperous suburb of Heaton: the plush tip up seats and boxes seated 925 in total. The cinema was a feature of Heaton life until June 1961 when it converted to a bingo hall that’s still going strong today. 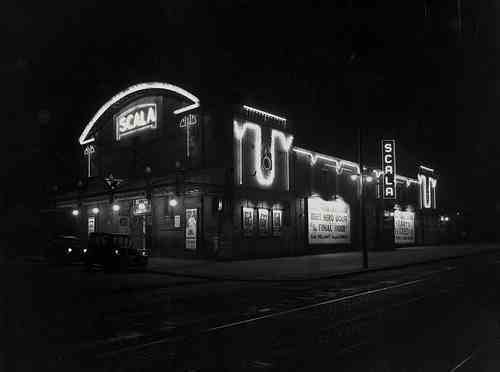 The next cinema to open was the Scala on the Chillingham Road site that Tesco occupies now. It opened on 10 March 1913 and so Heaton History Group will shortly be celebrating its 101st anniversary with a talk entitled A Night at the Pictures on the history of Newcastle’s cinemas. (See below for details). The Scala had ‘ a spacious tiled entrance, with marble staircases approaching the dress circle’. Its capacity was 1,200 and it cost £7,000 to build. At first it too held variety shows but these were soon abandoned. It eventually closed only a fortnight after the Electric (by now renamed the Heaton) on 1 July 1961. The original plans still survive and it’s hoped to put them on display in the People’s Theatre which now, of course, ensures that the building remains a much loved Heaton institution. And these were just the cinemas in Heaton itself. There were many more nearby: Byker was even better served than Heaton. The Sun in Long Row, Byker Hill (1909-34) was a family-run business, established by Carl Albert Aarstad, who came to Newcastle with his brother from Norway when a very young man, became a successful merchant and by 1911 was living on Heaton Grove and running his own cinema with his wife, Annie, and son, John. 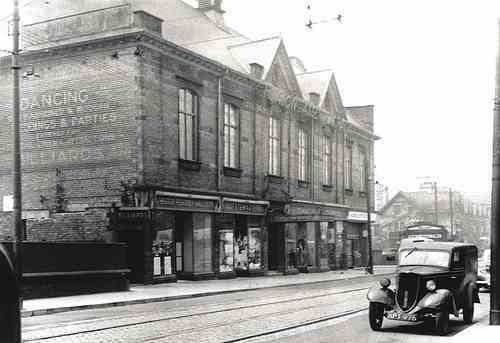 The Apollo ( Shields Road, 1933-41 and 1956-83) was bombed in World War 2 but eventually rebuilt to the original plan. And Byker was also home to the Bamborough (Union Road, 1913-59), Black’s Regal (later Odeon, Shields Road, 1914-72), the Brinkburn (1910-60), the Grand (1896-1954), the Minerva (later Imperial, 1910-63), the Picturedrome (1910-60), the Raby (1910-59). Amazing! Much of the above information comes from Frank Manders’ ‘Cinemas of Newcastle‘ (Tyne Bridge Publishing, 2005) where you’ll find much more fascinating information. There was not a cinema in the area I did not go to on a regular basis. My mother was a movie buff. I did tend to avoid The Imperial on Byker Bank and The Bamboro on Union Road, both of which were known as ‘flea pits’. The Brinkburn was not too far behind them, but as I knew the boy who helped in the projection box and who got me in for free, as they say, beggars can’t be choosers. There was also the Black’s Regal (which became the Odeon). That was a posher one even though it was in Byker! 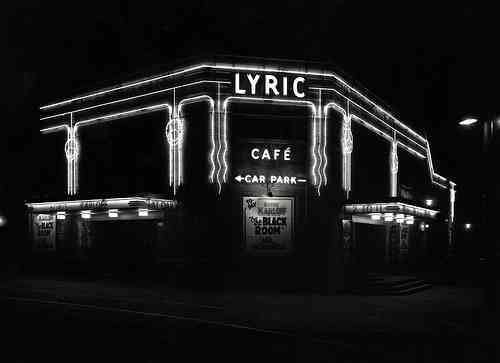 The three main ones actually in Heaton were, The Heaton, known as The Leccy (from The Heaton Electric Palace), The Scala on Chillingham Road and The Lyric on Stephenson Road, all of which I was a frequent patron. My mother’s friend was in the ticket box at The Lyric, so again I would get in for free and sit through the movies twice. My grandmother lived on Morley Street. There was an old cinema up there at the top of Shields Road where it curves round towards Walkergate, called, I think, The Sun and you could actually get in there for jam jars. You could take half a dozen with you and you could get in. That was the payment. You’d get cheaper seats… I think it was only a penny or a halfpenny to get in with money… But it was a real what you’d call a flea pit, with wooden floors and not much of a rake to it, so it wasn’t easy to see the screens. 0n 19 March 2014, Freda Thompson will give a talk on the history of Newcastle’s cinemas, entitled ‘A Night at the Pictures’. Afterwards, we’ll have an informal chat about our local picture houses and hope that some audience members will be able to add to our collective knowledge. The event will take place at the Corner House Hotel on Heaton Road. As usual, please book for the talk to ensure you’re not disappointed and be in your seat by 7.15 so that we can offer any unclaimed places to people on the waiting list or who come on spec. To reserve your place, contact Maria Graham: maria@heatonhistorygroup.org / 0191 215 0821 / 07763 985656. FREE to members; £2 to non-members. This entry was posted in Group Activites and tagged Assembly Rooms, bingo, Carl Albert Aarstad, Chillingham Road, cinema, Heaton Electric Palace, Heaton Grove, Heaton Road, Heaton Station, Lyric cinema, North View, People's Theatre, Scala Cinema, St Gabriel's estate, Stephenson Road on January 18, 2014 by oldheaton.